The control panel for the west end staging yard is now finished as you can see in the photo below. In the past, I have used Letraset dry transfer lettering and Chartpak tape for my panels. Once the lettering and track diagrams are in place, I spray the panel with a clear flat finish to protect everything. However, for this panel I wanted a different solution. Dry transfer lettering is getting hard to find and isn't easy to apply. The first place I went to look for alternatives was the Model Railroad Hobbyist forum. I quickly found a solution in a post by George Booth. You can read the post here: http://model-railroad-hobbyist.com/node/7237. I printed the labels in Word and took them to Staples for lamination. I then cut them out and glued them to the panel. What a great idea- thanks to George for posting this idea on the MRH forum. Speaking of lamination, I noticed that the train cards on the layout were beginning to show signs of wear after a number of operating sessions. In order to protect the cards, I bought some plastic sleeves to hold them. Unfortunately, they wouldn't fit in the bill boxes on the fascia. I mentioned this to Jim Rollwage, one of the regular operators, and he suggested I get the train cards laminated. Another great idea! All of the train cards were updated and printed on card stock. I then took them to Staples to get laminated. As you can see below, the lamination looks great and will protect the cards for a long time to come. Adding little details can really improve the overall appearance of just about anything on a layout. From uncoupling levers on freight cars to trash cans beside buildings, it's the small things that can really make a difference. I have a number of small detail projects either in the works or planned for the future, and as I wrap up other projects I make a little time to knock some of these out. Here are a few examples. 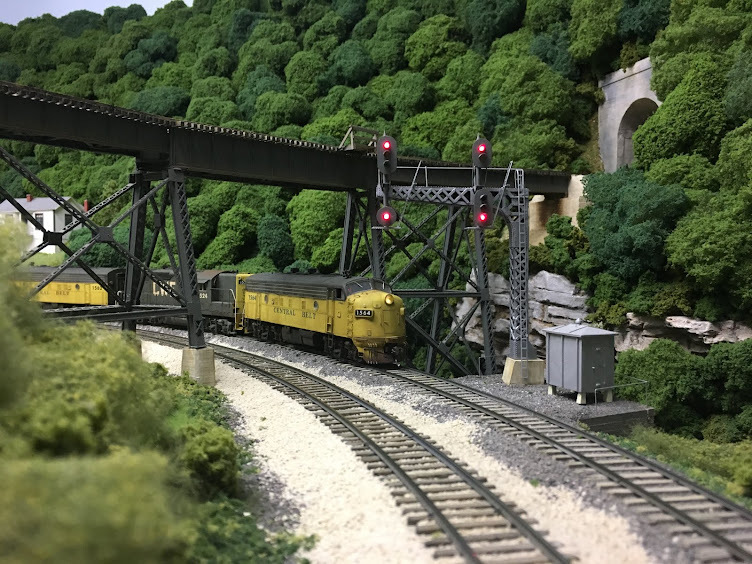 When I finished the article for Model Railroad Hobbyist magazine on constructing the small truck dump tipple at Big Chimney, I knew the scene was going to require some more detail. In addition to a small office, I wanted to add an oil tank next to the tipple. The oil was sprayed onto the coal as it was loaded into the hopper cars in order to keep down the coal dust and to help prevent the coal from freezing together in the winter. Robby Vaughn sent me several photos of Ajax Tipple on the Lott's Creek Branch of the L&N and one of the photos showed two small oil tanks. That provided the inspiration to get started on the project, and in short order the tank was in place next to the tipple. It was always my plan to add some additional weathering to the ramp up to the truck dump at some point, but studying some photos taken by Everett Young of tipples in the Pikesville, KY area showed some other details that could be added. It was fairly common for additional planks to be placed on ramps along the path of the truck tires, and I added these to the ramp. 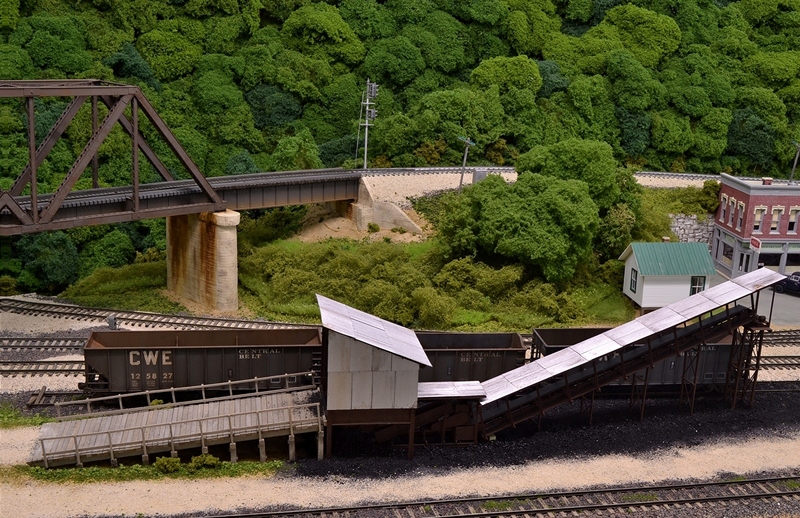 I also added Highball N-scale black ballast and crushed coal all along the ramp. And as you can see from the photos below, I added a lot of additional coal and coal dust to the area around the tipple. The line between the gravel and the spilled coal under the tipple had always looked too neat, and the addition of the coal and coal dust was a big improvement in the overall appearance of the area.The photo below shows the addition of the planks. And here are before and after photos showing the addition of the ballast and coal to the ramp and the area around the tipple. For the small office, I scratch-built a structure using styrene and a window and door from the scrap box. The office is based upon the manager's office of the Crab Orchard, WV tipple that you can see on the coalcampusa.com website. Here's a link to the site: http://www.coalcampusa.com/sowv/gulf/crab_orchard/crab_orchard.htm. Scroll down to the bottom of the page to see the photo of the office. Some barrels and junk completed the scene. To finish the area, I added some static grass and some junk to the path from the tipple to end of the gravel road. I also highlighted several areas where the road has turned to mud. When I first saw photos of the yard speakers at Clifton Forge on the C&O, I knew I had to have some of these for Hollister Yard. These speakers were used to communicate with yard crews on the ground before the advent of hand-held radios. The C&O used them at many locations across the system, and I'm told the L&N used them extensively too. At first I thought I was going to have to scratch-build them, but then I found a beautiful casting from Details West of the speaker. A little yellow safety paint and some light weathering and they were ready to be installed. In the photos below, you can see the speakers in the west end of Hollister Yard. Additional speakers will eventually be installed along the east end, too. The small switchman's shanty at the west end of Hollister Yard was scratch-built based upon some plans of a NYC shanty that appeared in Model Railroader many years ago. Given the proximity of the structure to the tracks, it seemed that some type of protection was needed for personnel existing the building. I had seen photos of similar structures with old rail used for this purpose. I clipped a couple of pieces of Code 55 rail, painted them safety yellow, and them mounted them in front of the door. Now anyone exiting the building will be diverted from walking straight onto the tracks. It occurred to me while writing this blog that the switchman's shanty would likely have the remnants of an old coal bin either next to the building or nearby. The bin would have become obsolete when the oil stove was installed. Looks like there might be another small project to add to the list. Studying prototype photos can provide a wealth of little details that can be added to scenes around the layout. And not only can these little details can really improve the overall appearance of just about any scene, but they are fun to build as well.